After my enthusiastic skewering of awful Death Star cakes last week, karma and my innate Jewish guilt demand that I sing the praises of a (far more impressive) Death Star cake for you this week. Behold Rachel and Leander’s chocolate1 Death Star wedding cake, adorned with royal icing! Complete with trench, for your Rebel-attack convenience. 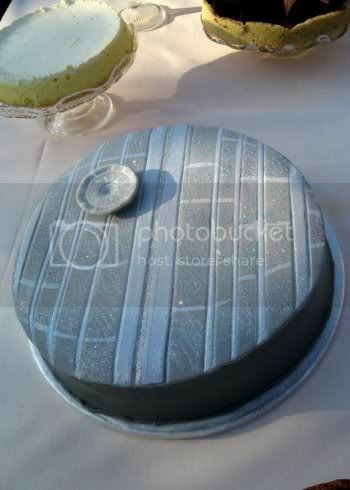 This handsome cake features a resemblance to the Death Star strong enough that I can forgive the satellite dish where a planet-destroying turbo laser should be. Brits Rachel and Leander initially had a tough time convincing the cake artisans at London-based Konditor & Cook that they actually wanted to model their wedding cake after a fictional space station. Heh. Awesome. Even though methinks “gay” means something different in British than in American. UPDATE: I’ve been notified that Leander is, in fact, a woman and “gay” means exactly the same thing in the U.K. as it means in the States. Which makes the above quote about the “big gay wedding” twice as awesome. But once they realised we were serious – they were lovely and the guy even apologised for being less than enthused with the idea the first time round! Normal people sometimes have trouble digesting geekiness – especially when it bursts into traditional territory! Tell me about it. You should have seen the rabbi’s face at my Bar Mitzvah2 when I read from the Torah in my Darth Vader voice. Thanks to Rachel and Leander for the details, and to Sophie and Bernie for the photo. 1 I can only assume it was Dark chocolate. The Sith wouldn’t have it any other way. 2 That is a joke. I never had a Bar Mitzvah. Those are only for Jews who don’t mind the book learnin’. Yes. But only in countries where they’ve already realized they have better things to worry about. And for my sterling, there’s nothing better than sucking on a fag after a good rogering. I say it doesn’t count if it ain’t spherical. Go hard or go home, awesomely geeky cake makers.